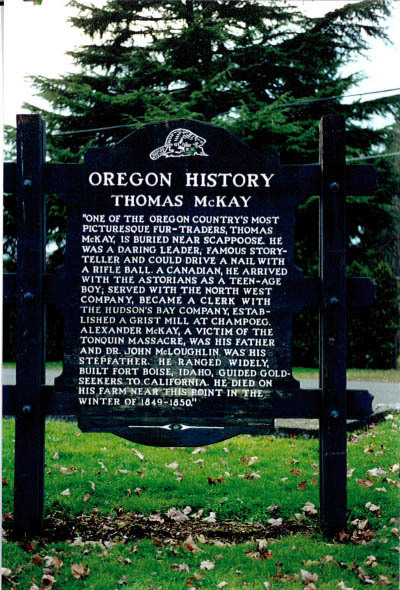 Subject:Thomas McKay, Hudson’s Bay Company fur trader and operative, died near here. 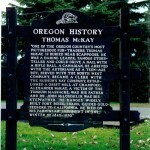 ‘One of the Oregon Country’s most picturesque fur-traders, Thomas McKay, is buried near Scappoose. He was a daring leader, famous storyteller and could drive a nail with a rifle ball. A Canadian, he arrived with Astorians as a teenage boy; served with North West Company, became a clerk with the Hudson’s Bay Company, established a grist mill at Champoeg. Alexander McKay, a victim of the Tonquin Massacre was his father and Dr. John McLaughlin was his stepfather. He ranged widely, built Fort Boise, Idaho, guided goldseekers to California. He died on his farm near this point in the winter 1849-1850.